Posted March 12, 2015 . Around 10 million people in Africa receive antiretroviral therapy (ART) for HIV infection, but mortality during the first year of treatment particularly in the first few months, is very high, much higher than in Europeans. Notably tuberculosis and cryptococcal meningitis account for the majority of deaths in Africa in HIV patients. A paper published in the Lancet online this week has highlighted that the provision of a short period of community support from lay workers alongside screening for cryptococcal antigen, substantially reduces mortality in patients with advanced HIV disease, who are commencing antiretroviral therapy. The mortality was 30% less in patients who had received this package which cost between $30 -70 per patient. This open label randomised trial took place in Tanzania and Zambia with 1999 enrolled patients and the results were consistent in both countries. The shortage of qualified health care workers is a challenge in Africa, but this study indicates that some simple community support alongside screening for cryptococcal antigen could be an easily implemented strategy for reducing mortality. 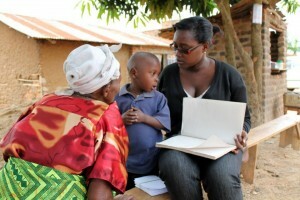 Article : Sayoki Mfinanga et al Lancet March 10th, 2015.